Dairy cows continue to leave Western organic dairy herds to be sold into slaughter auctions, according to USDA's Dairy Market News. At a recent auction in Oregon, organic cows sold for slaughter continued to bring a premium over conventional cows. The top 10 organic cows auctioned brought an average price of $1.8379/lb., compared with a $1.1476/lb. average for the top 10 conventional cows. The current top 10 organic cow slaughter price is up from $1.8324/lb. last month, while the top 10 conventional price is down from last month's $1.1506/lb. average. The top 100 organic cows brought $1.5631/lb. versus 95.43¢/lb. for the top 100 conventional cows. A number of organic processors are actively recruiting existing conventional dairy producers and young farmers to transition into organic dairy production. Recent high prices for conventional milk are being cited as an encouraging factor, allowing transitioning producers to receive higher- than-normal conventional milk pay prices during the transition process. A factor being watched by existing organic dairy producers, as well as farmers considering transitioning into organic dairy, is organic feed supplies and cost looking forward. That is leading to active evaluation of the 2014 organic feed harvest to better plan ahead for herd size and feed variables. Prices are steady on all organic grains, with market activity slow to moderate. Demand for organic corn and wheat is light to good; organic soybeans light to moderate; and light to moderate for other smaller organic grains. 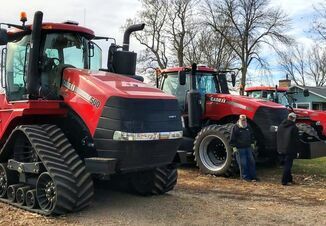 Producers and processors continue to be focused on harvesting efforts, especially in light of recent cold temperatures and storm activity moving throughout the country. Other concerns included moisture levels and test weights, drying costs, storage, transportation, and wheat quality and availability (e.g. protein levels, weather challenges, associated plant diseases). What Does a Dairy Farm in Arizona Look Like?